Special Containment Procedures: Any accounts that fit the description of an encounter with SCP-3901 are to be investigated by field agents immediately. Civilians targeted by SCP-3901 will need to be debriefed, undergo Procedure Zara-22, and be amnestitized before being released. Capture of SCP-3901 using standard anti-intangant acquisition methods is Priority-Delta. SCP-3901 has yet to be recorded on digital video or photographed, but its voice has been captured on audio during observations. Research Outpost-3901 is to be situated near proximity of SCP-3901's grave site under the guise of an isolated family farmhouse. Continuous seismic and audio monitoring of SCP-3901's grave site is required until permanent containment is possible. Any new bodies detected underground at the site will need to be exhumed from SCP-3901's coffin. Description: Based on eyewitness accounts, SCP-3901 is an entity that takes on the appearance of a mummified human female corpse with long hair and wearing only a men's dress shirt. It is theorized that SCP-3901 is sapient but frequently suffers from acute memory loss based on its behavior. SCP-3901 displays a selection process of targeting single male individuals who regularly sleep alone. SCP-3901 will then regularly manifest within the bedroom and enter the target's bed. Once in the bed, SCP-3901 will typically lay in a supine position or a fetal position facing the target, in some cases embracing the target from behind in a seemingly affectionate manner. SCP-3901 always exercises caution in not waking the target, but has been reported to touch the target's face gently in rare instances. SCP-3901 will usually vanish once the target wakes. The purpose of this behavior is largely unknown, but has generally not resulted in hostility towards the target unless SCP-3901 reacts extremely negatively toward Procedure Zara-22. Typically, this behavior will continue for about a month before SCP-3901 begins to actively communicate with the target. Most of these conversations tend to be one-sided, with any responses towards SCP-3901 being seemingly ignored. Below are a few selected responses from SCP-3901 that were recorded during observation sessions conducted by field researchers. "Do you think of us; of me?" "I have never felt this way." "I was so lonely… so cold… but you are warm next to me." "I can stay here forever." "I'm scared to lose this; are you scared too?" 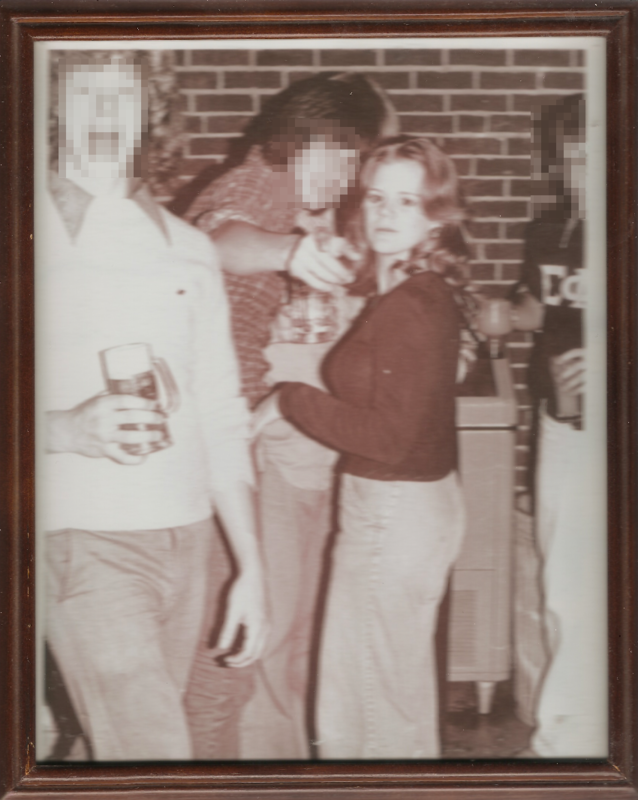 Photograph on file for SCP-3901, circa 1973. Addendum-3901-001: SCP-3901 is believed to be an entity previously known as Ms. Rachel Parks. According to local police reports, Ms. Parks was reported missing after a hiking trip and likely died shortly thereafter in September, 1973 from exposure. The partially naked corpse was discovered the following spring, though it was badly decayed making identification difficult. Afterwards the body was transported back to her family in Kansas, USA to be buried in its current location. Interviews with family and friends of Ms. Parks stated that she had an ongoing conflict with her roommate at the time, over an estranged boyfriend. Foul play was ruled out by the detective supervising the case when it closed after the examination of the body. Addendum-3901-002: Procedure Zara-22 is a protocol that has had limited success in field trials but is the only known method that has been able to deter SCP-3901's interest from a victim. Field agents administering Procedure Zara-22 are to have a 4x6 photograph of Ms. Valerie Jameson, Ms. Parks roommate at the time, displayed somewhere in plain sight of the affected bedroom. In 78% of cases, SCP-3901 immediately departed upon viewing the photo. 22% have invoked a passive-aggressive conversation from SCP-3901 itself with a small percentage resulting into eventual hostile aggression against the victim where they are suddenly transferred under SCP-3901's grave site. Should hostile aggression be suspected, agents are given permission to intervene and attempt to extract the victim to prevent an incident. "She will never love you like I do." "Will you even miss me?" "I will make you love me." "You will thank me for this." "This is for the best." "I'm not giving up on us." "I won't have this baby… not without you."